Showers and even a few embedded thunderstorms are developing out ahead of a wave of low pressure now tracking across western Kentucky. Not only will the the second half of today/first half of tomorrow be rainy but also very cool. Harrisonburg will only see highs make it into the low to mid 70s. This is 10-15 degrees below average and not too far off the all time August 6th "coolest high" of 69 (these records date back to 1893 and we will crack the top 5 if we stay below 75). 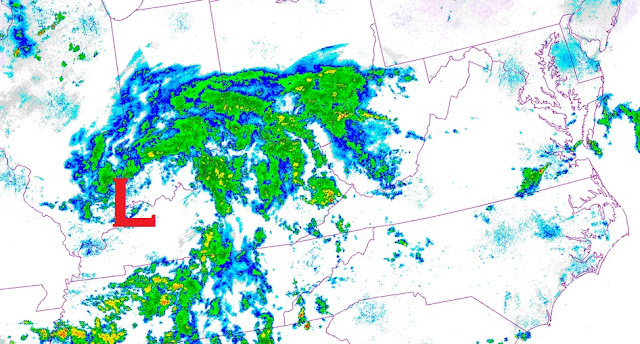 Showers will begin arriving in the Shenandoah Valley around or shortly after noon. Looks like the heaviest, steadiest rain will hold off until this evening into the overnight with the arrival of a stronger piece of upper level energy. Rain will gradually taper off west to east during the day Friday. Total amounts will generally range from 0.5-1.0" with localized banding potentially dropping as as much as 2" (the best chance for this appears to be on a line between the New River Valley and Hampton Roads). Although its been a rather dry past few weeks and flash flood guidance---an estimate of the average number of inches of rainfall over a duration required to produce flash flooding---is high, there may still be a few isolated runoff issues. On the bright side, dry weather with lots of sun and seasonable temperatures on tap for the weekend.